Here's a shout out to all my homies in the IPv6 world! 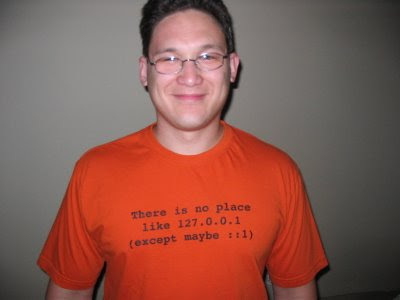 If you can't read it, it says "There is no place like 127.0.0.1 (except maybe ::1)". Thanks go to Tarek Ziade (ziade.tarek at gmail.com) for the custom T-shirt design. That is indeed very cool! The IPv6 list has kinda cooled down (it's been even renamed to 6man—“IPv6 maintenance”—so I'm not really sure how many people would left there appreciate it. Actually, I think that's very good news.